BURNABY, British Columbia, Canada, March 27, 2108 (ENS) – The City of Burnaby is taking its battle with Texas-based energy giant Kinder Morgan to the Supreme Court of Canada in an apparent attempt to halt a pipeline expansion that would multiply oil tanker traffic on Canada’s West Coast by a factor of seven. The legal fight concerns Burnaby’s opposition to Kinder Morgan’s C$7.4 billion Trans Mountain oil pipeline expansion project from Edmonton, Alberta to Burnaby. The expansion – from 300,000 to 890,000 barrels of tar sands crude oil per day – would increase oil tanker traffic on Burrard Inlet and the British Columbia coast seven-fold. The project would add roughly 980 km of new pipeline and reactivate 193 km of existing pipeline. New facilities will include 12 new pump stations, 19 new tanks added to existing storage terminals, and three new berths at the Westridge Marine Terminal on Burrard Inlet. Supporters say the new pipeline capacity will be good for the Canadian oil industry, create thousands of jobs and millions in new tax revenue for B.C. and Alberta. Critics say it would put the British Columbia coastline at constant risk of oil spills and make Canada’s climate change goals impossible to achieve. The City of Burnaby, as well as the City of Vancouver and the government of British Columbia, all oppose the Kinder Morgan pipeline expansion. Yet it was approved by the Liberal Government of Canada led by Prime Minister Justin Trudeau in November 2016. Burnaby announced its decision to appeal to the Supreme Court of Canada after the Federal Court of Appeal refused Monday to hear the city’s appeal of a December 2017 decision by the National Energy Board (NEB) to relieve Kinder Morgan of its requirement to follow Burnaby’s construction bylaws. This means that Trans Mountain is not required to pass a Preliminary Plan Approval nor obtain municipal tree cutting permits for its Burnaby Terminal and Westridge Marine Terminal pipeline worksites. Kinder Morgan argues that Burnaby’s construction bylaws are unconstitutional, as they conflict with the company’s ability to proceed with the federally approved project, and with the NEB Act. Trans Mountain also claims that Burnaby is deliberately delaying permit approval because it is politically opposed to the project. “Kinder Morgan is committed to continuing to work with stakeholders in good faith as we continue with construction of the Trans Mountain expansion project,” the company said. Fifteen other challenges have been filed with the Federal Court of Appeal against the federal government’s approval of the Kinder Morgan pipeline expansion. Federal Natural Resources Minister Jim Carr reiterated the Government of Canada’s support for the project while in Vancouver earlier this month. 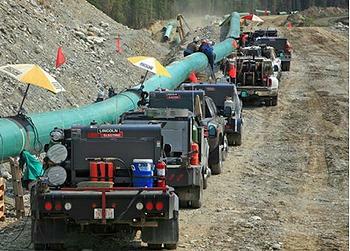 There is little public support and much protest action surrounding the pipeline expansion battle. The demonstrations have been led by Coast Salish spiritual leaders and members who have raised a traditional Coast Salish Watch House near the Kinder Morgan pipeline route. The indigenous peoples of the Musqueam, Sḵwxwú7mesh and Tsleil-waututh, who have resided in this territory for thousands of years. Seven indigenous First Nations have legally challenged federal approval of the pipeline expansion. Together with the cities of Burnaby and Vancouver and two environmental groups, they are asking the court to overturn the federal government’s decision to approve the expansion. Chief Ian Campbell of the Squamish First Nation said the federal government failed to consult or gain consent of First Nations for the expansion of the oil pipeline, so they have to try to protect their land and water in the courts. Daily protests and arrests have continued since March 10 although a B.C. Supreme Court ruling prohibits protesters from setting up blockades or interfering with work at the terminal. On Saturday, March 17, roughly 10,000 people marched against the pipeline project. 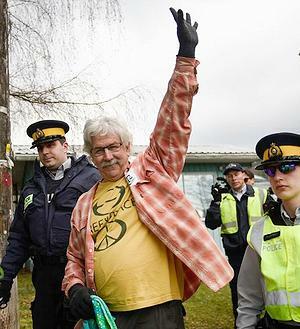 At least 170 people were arrested between March 17 and 24 for protesting at the Kinder Morgan terminal on Burnaby Mountain. 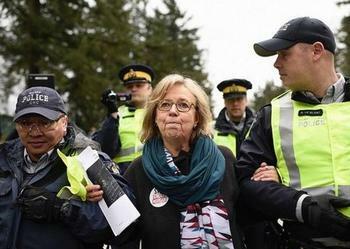 Federal Green party Leader and Member of Parliament Elizabeth May and Kennedy Stewart, the New Democratic Party MP for Burnaby South, were arrested Friday protesting in the court-ordered no-go zone at the gates of the Kinder Morgan tank farm in Burnaby. May said the permits issued for the project to proceed did not respect the rights of Indigenous people on their territory. “The commitment to build a pipeline in 2018, when we are in climate crisis, is a crime against future generations and I will not be part of it,” she said. May was charged with civil contempt for blocking a road – not a criminal charge. “It’s a combination of the disastrous potential of this project, but also betrayal around how it was approved that is moving many of my constituents to take the actions that they are,” said Stewart. 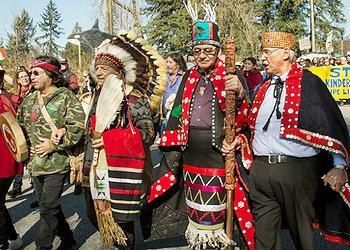 Now Coast Salish spiritual leaders are calling for a week of ceremony before “bold actions” begin again. Protests in solidarity have spread south of the border to Washington state. 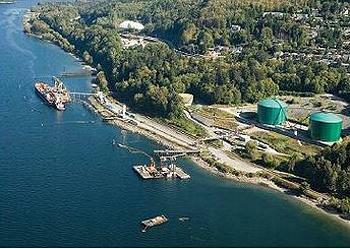 Kinder Morgan, Inc. is one of the largest energy infrastructure companies in North America. It owns an interest in or operates approximately 85,000 miles of pipelines and 152 terminals. The pipelines transport natural gas, refined petroleum products, crude oil, condensate, CO2 and other products, and its terminals transload and store petroleum products, ethanol and chemicals, and handle products such as steel, coal and petroleum coke.